We’d love your help. Let us know what’s wrong with this preview of It Happened in Connecticut by Diana Ross McCain. 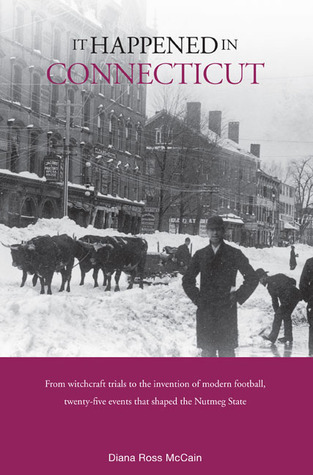 It Happened in Connecticut tells more than two dozen true tales of famous--and infamous--people and events from the state’s past, ranging from witchcraft trials to the Wiffle ball, from mass murder for profit to the modern game of football. To ask other readers questions about It Happened in Connecticut, please sign up. I learned a lot about the old Nutmeg State from this little gem of a book. Every anecdote is well-researched, well-written and entertaining to read. I highly recommend this to Connecticut residents and anyone else interested in a little state with deep historical roots. This non-fiction work describes many of the made or done-in-Connecticut wonders that shape our world. Football, vulcanized rubber, a school for the deaf...and plenty more started in this little state. I bought this book for reading material in my literacy classes. I want my students to know where they live. I am confident the text will do the job. Interesting stories about CT history; who knew that there were witch trials in CT! or that Goodyear created rubber in CT. A fun read. Diana Ross McCain is an independent historian who has been researching, writing, and speaking about Connecticut and New England’s past for more than thirty years. She was on the staff of the Connecticut Historical Society in Hartford for twenty-five years. Since 2015 she has been a partner in “Come Home to Connecticut,” an enterprise which offers historical and genealogical research services, cons Diana Ross McCain is an independent historian who has been researching, writing, and speaking about Connecticut and New England’s past for more than thirty years. She was on the staff of the Connecticut Historical Society in Hartford for twenty-five years. Since 2015 she has been a partner in “Come Home to Connecticut,” an enterprise which offers historical and genealogical research services, consulting, and programming. Diana is the author of several non-fiction books, including It Happened in Connecticut, Mysteries and Legends of New England, and Connecticut Coast, all published by Globe Pequot Press; and the award-winning To All on Equal Terms: the Life and Legacy of Prudence Crandall. She has also written extensively for publications such as Early American Life and Connecticut magazines, and the Hartford Courant. Thy Children’s Children is her first novel. Diana holds bachelor’s and master’s degrees in history, and a master’s degree in library science. A native of Ohio, Diana has lived in Connecticut for forty years.